The serving size we see on everyday food products is rarely never an actual serving size. Five crackers is hardly a serving size. (Maybe if stacked high and layered with peanut butter.) Of course, the reason food companies do this is to make it seem like we are eating less calories, but we all know they’re not fooling anybody. When it comes to actually trying to keep track of what we are consuming, those familiar little Nutrition Facts labels are of little help. Counting calories is not supposed to involve math. At least not for you. Luckily, the Perfect Portions Digital Scale + Nutrition Facts Display can deal with that pesky multiplication table for you. 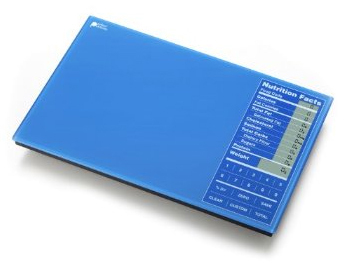 The kitchen gadget contains a built in database of 1999 foods, and returns a customized Nutrition Facts label when a corresponding food item is weighed. Now you can finally find out how many multiples of 100% daily value you’ve really been consuming. Just a guess, but I bet that half a jar of peanut butter is up there. * Calculates weight plus % Daily Value for calories, fat, carbohydrates, cholesterol, sodium, fiber and protein. * Easy-to-clean, stylish glass design with hygienic touchpad keys. The inventor of the personal microwave is… Heinz?